Nothing suitable in promotional rubber ducks? How about custom branded animal stress balls, logo printed corporate kids plush toys or one of our promotional bathroom accessories? Custom printed rubber ducks are great for bathroom accessories and make good promotion products at functions involving children and children alike. 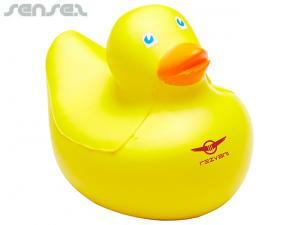 Who doesn't like a cute rubber ducky to display in the bathroom while soaking in a warm relaxing bathtub? Choose from our extensive range of marketing bathroom ducks, bathroom toy ducks, shaped bathroom ducks, hotel bathroom ducks all with your custom logo print. We as promo company offer a huge range of rubber ducks to suit your brand and business needs, including: promotional baby rubber ducks, logo branded baseball player rubber ducks, promotional basketball player rubber ducks, promotional cheerleader rubber ducks, promotional chief rubber ducks, team logo cowboy/cowgirl rubber ducks, promotional diver rubber ducks, promotional fireman rubber ducks, company logo handyman rubber ducks, promotional ice hockey player rubber ducks, promotional lifeguard rubber ducks, promotional pampered rubber ducks, promotional police rubber ducks, promotional sailor rubber ducks, custom printed Santa rubber ducks, promotional astronaut rubber ducks, promotional Mexican sombrero wearing rubber ducks, promotional graduate rubber ducks, promotional surfer rubber ducks, and promotional tennis player rubber ducks. We also have cute environmentally themed rubber frogs, custom printed rubber pigs- great for farms and meat promotions and logo rubber whales that are ideal for marine themed marketing campaigns such as anti-whaling campaigns. 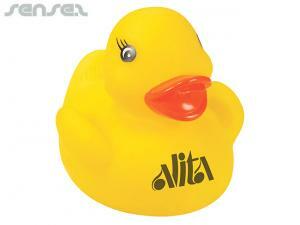 Custom printed rubber ducks will give your brand great exposure and awareness. They are adorably cute and make the perfect promotional gift give away.